Typhoid fever and Paratyphoid fever are bacterial infections caused by Salmonella enterica Typhi and Paratyphi types A, B, and C, respectively, which are transmitted through the ingestion of tainted food and water. World-wide, an estimated 17 million cases and 600,000 associated deaths occur annually. The clinical diagnosis of infections traditionally depends on blood culture or the Widal test. 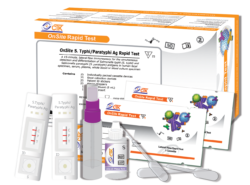 However, many limitations such as the long time to result for blood tests (3-4 days) and difficulties in the interpretation (Widal test) make them unpractical for screening patients in endemic environments and can lead to misdiagnosis and misuse of antibiotics. 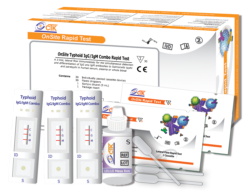 CTK’s diagnostic tests for typhoid fever are simple and rapid, screening tests that simultaneously detect and differentiate between IgG and IgM antibodies to S.e.Typhi and Paratyphi produced in response to infection, thus, aiding in the determination of current or previous exposure.